Welcome to the Demon Road: an extensive network of dark and distrustful activity across the United States. Much like the Dark Web, it’s reach is extensive…but you may not even know it’s there. At least, not until your parents reveal their skin-red, horned demon glory to you and tell you that you’ll be their next meal. How do you escape their scaley talons? If you’re Amber, you take to the Demon Roads with Milo, a man who drives an car that’s more creature than alloy and an Irish boy who’s hopelessly inadequate at anything, really. It must be hard leaving a world like that of Skulduggery Pleasant: after 9 books, countless short stories and several years. Or perhaps it’s a welcome change: the opportunity to start something new, turn open a fresh page. Saying that, Landy doesn’t reinvent himself much. Demon Road is recognisably the work of the Irish-author: the same dead-pan humour, ensemble of characters and supernatural creations. It’s familiar yet different, and depending on whether you loved Skulduggery Pleasant and were hoping for more of the same, or were looking for Landy to turn in a completely different direction, you’ll be pleased or disappointed. The similarities don’t stop there. Amber, our new female protagonist, isn’t that recognisable different from Stephanie in the Pleasant series; and she’s running around with older male mentor figure Milo. They’re joined on their road-trip across the states by Irish eighteen year old Glen; by far the funniest character in the novel, his inane humour and generally annoying-ness is really quite entertaining. The few scenes without him feel ever so slightly lifeless, and I was ready to give up on Demon Road prior to having met him. I’m glad I didn’t. It’s hard not to compare Demon Road to the series that brought Landy such popularity as a writer, but this new world did grow on me. It’s slightly more horrory, and the monsters are best when they taunt Amber, Milo and Glen psychologically rather than physically: I’ve read enough of Landy’s punch-ups to become desensitised by them, cinematic as they are. 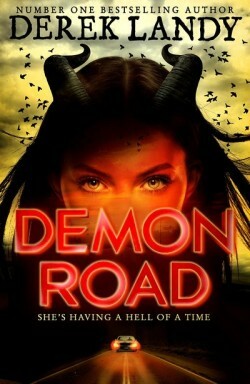 There’s potential here; by the end, Demon Road had me quite entertained and left open for a sequel (sequels? ), there’s plenty of time to make the trio distinct characters. Will it outshine Skulduggery Pleasant? Probably not. Will Landy give it his best shot? Probably – and that’s more than enough to keep me entertained.